Welcome to Kid Central, a.k.a. the Wilson Playroom! This upstairs front room over the garage (or the F.R O.G. as we Realtors call it here in the south) is one of my favorite rooms in our house. The sunshine pours in through the arched windows and the sounds of hide & seek giggles, rambunctious laughter, Nerf gun battles and video games fill the room with family fun! (Yes, I’ll call him my “hunky- hottie” when he willfully helps with DIY projects!). 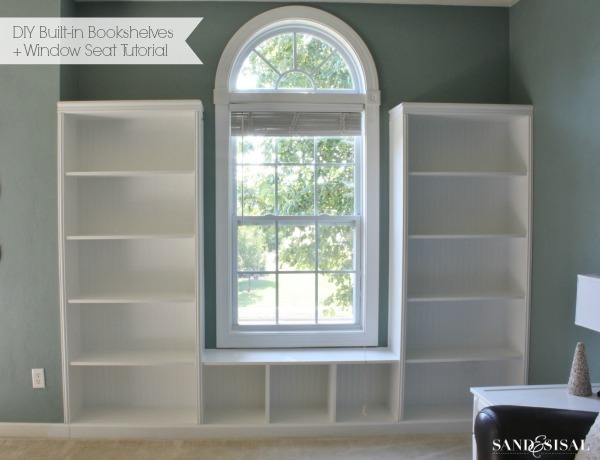 We completed DIY Built-in Bookshelves with a Window Seat and posted the full, step-by-step tutorial with plans, so check it out! I wish I had built these years ago! It was easier than we expected. In the meantime, the toys were dumped across the room, books piled up, video games, and legos… oh lawd… the legos… were everywhere! We needed to get organized ASAP! 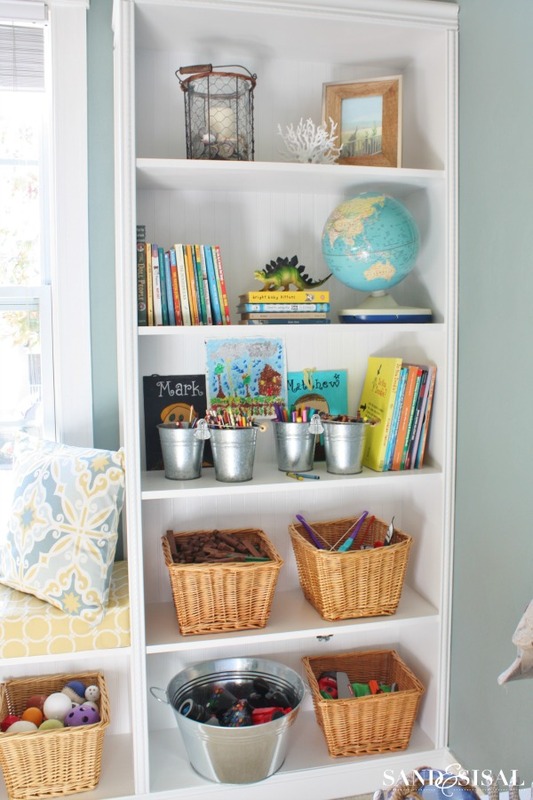 I’m going to share my Playroom Storage Ideas for these built-in bookshelves with you today! TA-DAAAAA! I am in organized-7th-heaven now! 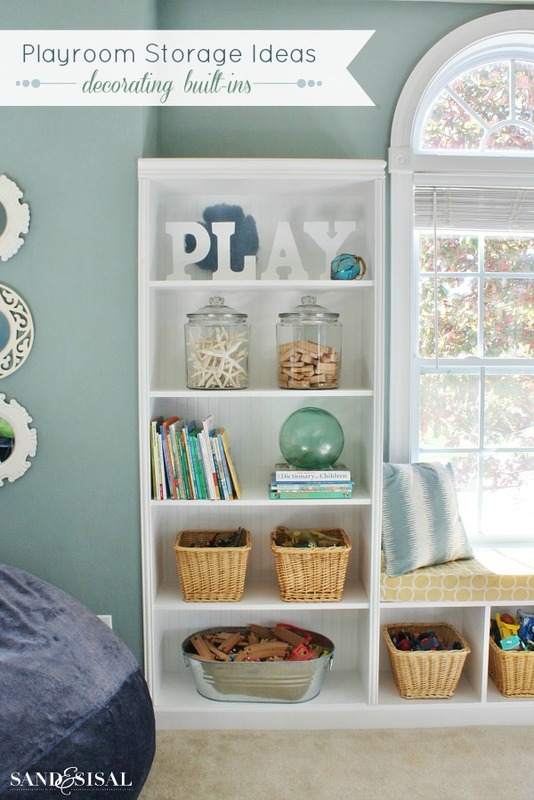 GET ORGANIZED: Let’s look at how you can organize your toys and decorate the bookshelves. We are a family of 6 and my kids range from age 8-18 (2 boys & 2 girls). So needless to say we have a TON of toys which have been accumulated over the years. PURGE: The first step is to PURGE! 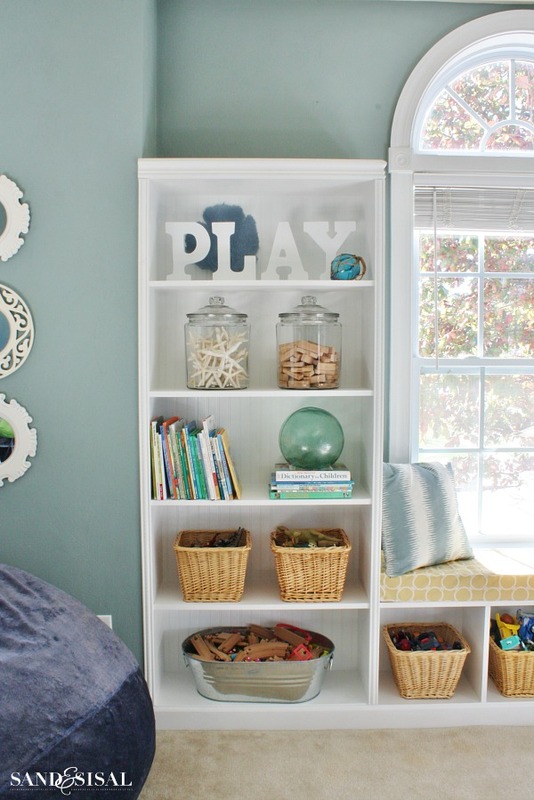 Purging is a very cleansing and necessary process for any playroom organization. We bagged up several bags of toddler toys and books and donated them to a local children’s charity and to Operation Christmas Child. I think we probably cut our toy amount down by at least half. Having your children participate in this process is very important. They need to understand the wealth they are blessed with and learn to let go and share what they have with others less fortunate. It also teaches them organization, compartmentalization, and prioritization skills. 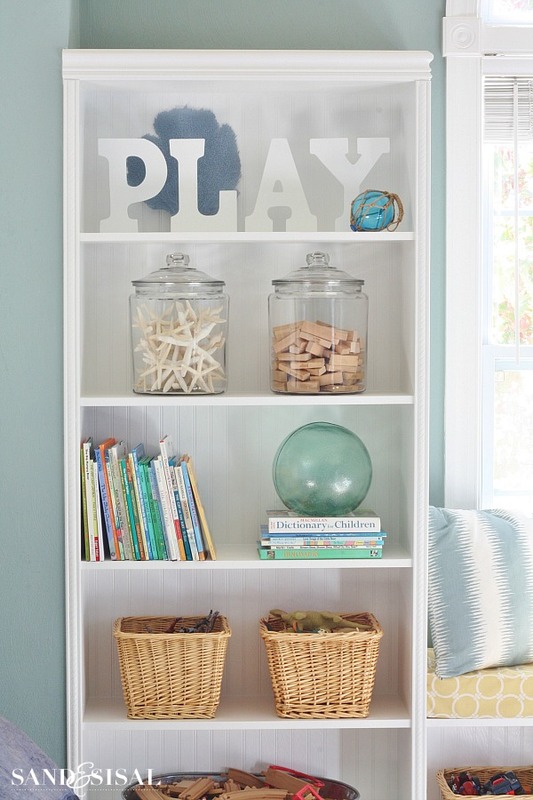 When you start to organize and decorate your playroom bookshelves, try to look for containers that vary in size, matter, and texture, like glass, wicker, and metal containers. 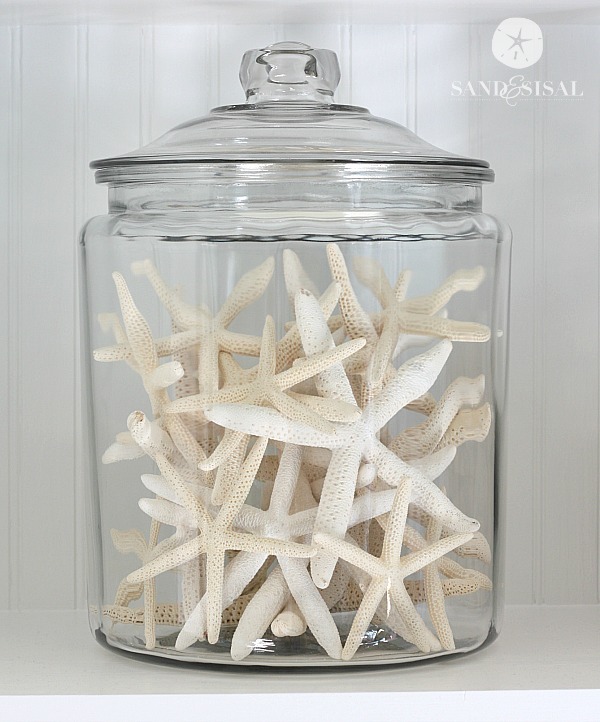 I love using large glass kitchen jars, normally used for storing pantry items, to contain precious collections like these pretty starfish …..
or storing fun Jenga wood game pieces. I love playing Jenga, my daddy was a Jenga master… oh how I miss that man terribly. Where would we be without wicker baskets? Separate your toys into categories (for example) like Animals, Action Figures, Cars, Lincoln Logs, Nerf guns, etc. Place (and try to limit) one specified category into one basket. 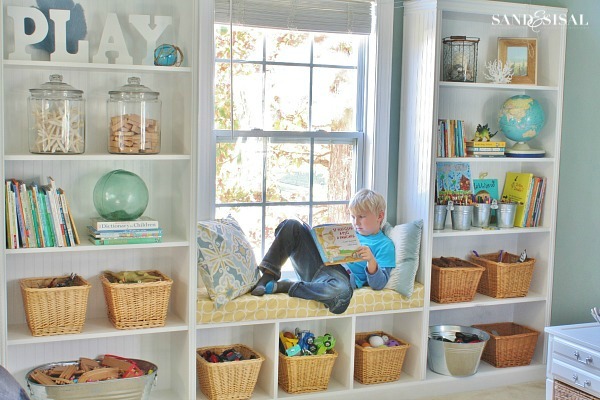 This basket organizing method really helps the kids to stay organized, especially during clean-up time. Use large galvanized pails to store large items like game controllers, train sets, large toy cars, or costumes accessories. The silver sheen adds just the right amount of sparkle to the room with out being overtly glitzy. Your local big box hardware stores are great places to find affordable galvanized metal containers. 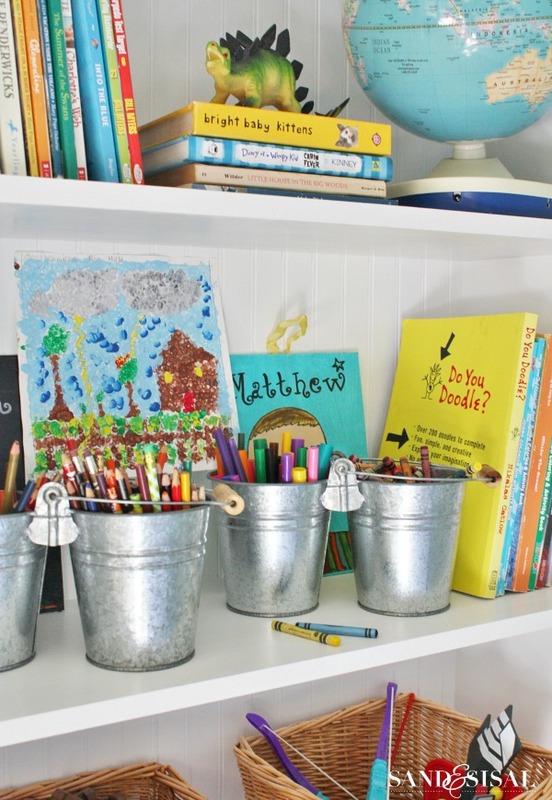 Gather coloring books, drawing paper and art supplies like crayons, markers, and colored pencils and place them in easy to transport galvanized pails. Show off their mini-masterpieces on the shelf wall behind! RACK EM’ & STACK ‘EM! Book collections can easily get out of control. Purge and donate books yearly. 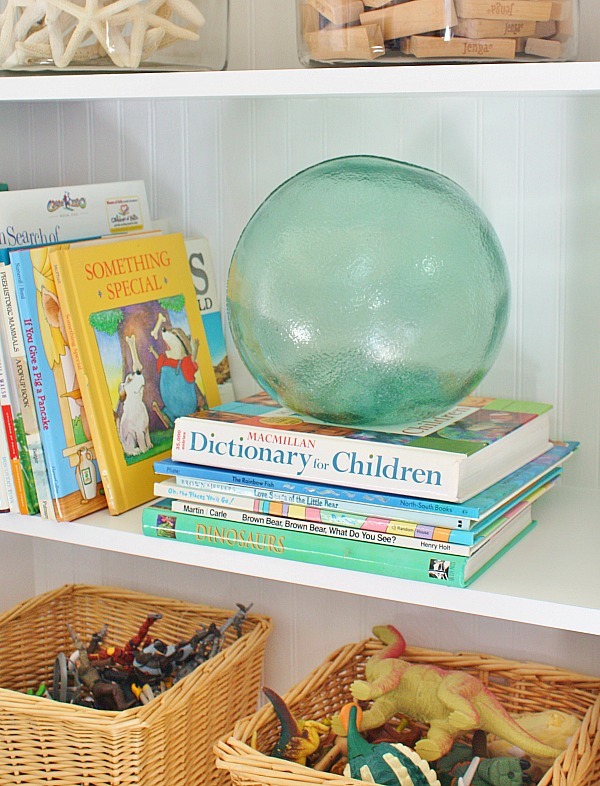 Group your favorite children’s books vertically and also horizontally. 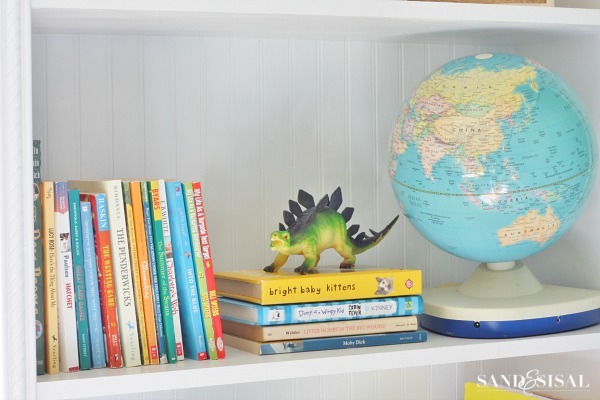 Place a fun toy on top of a book stack for a whimsical touch. 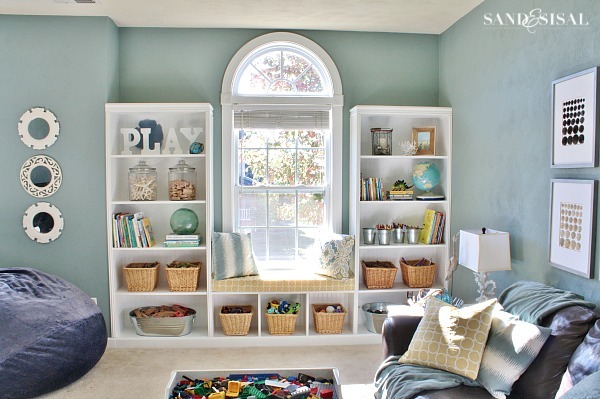 DECORATE: Yes this is a playroom, but every room deserves to be BEAUTIFUL! My kids certainly don’t need to be told to PLAY at all, but these white wood letters are a fun affirmation that this is the room where playtime takes place! A blue sea fan and glass floats give the room the coastal nod that we love. Add colorful pillows and a window bench if possible. 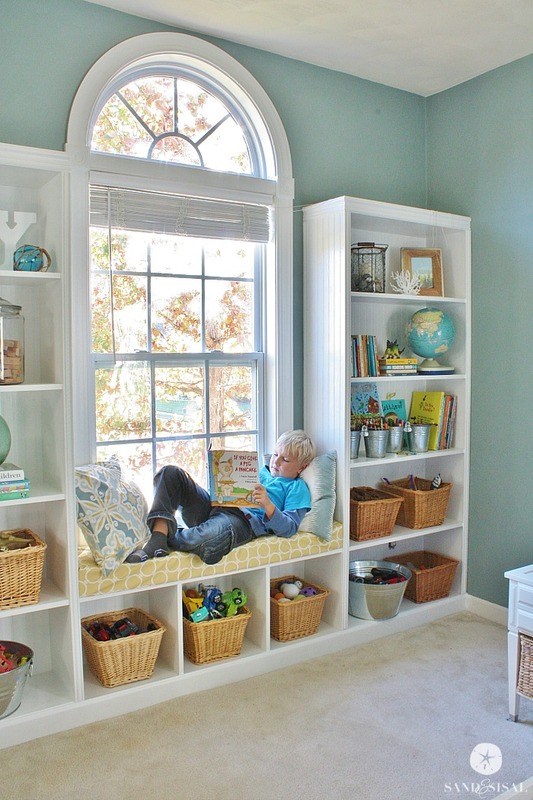 Create a comfy and cozy reading nook. I’ll be posting about how to make that window cushion and pillow covers soon. 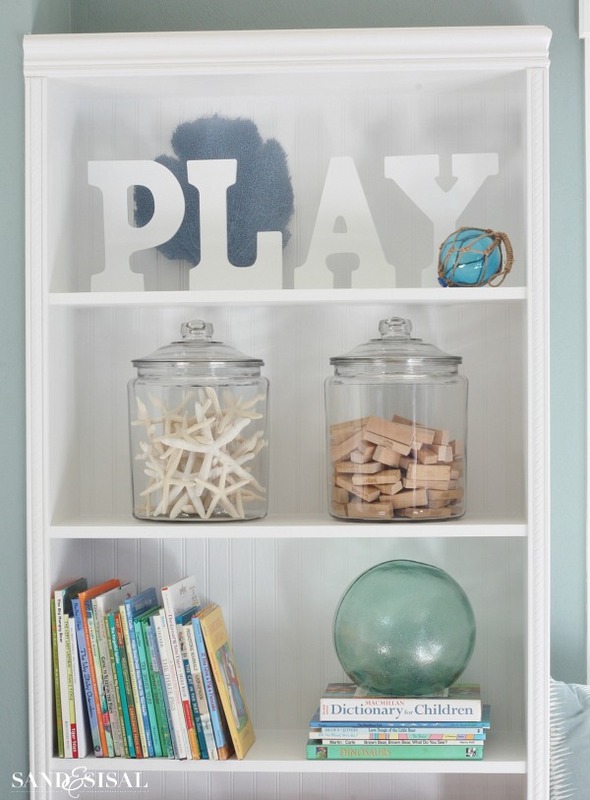 I couldn’t be happier with how all these playroom storage ideas worked out for our home and I hope you like them too! 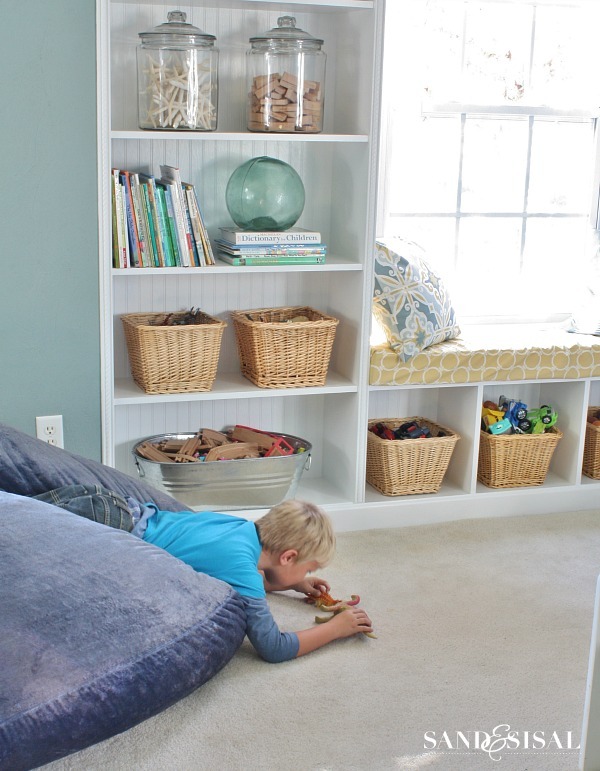 Pin your favorite pic and let me know what organizational tips have worked for you in your playroom! I’d love to hear from you! Haha! Thank you so much Debbie! It came out fabulous!!! 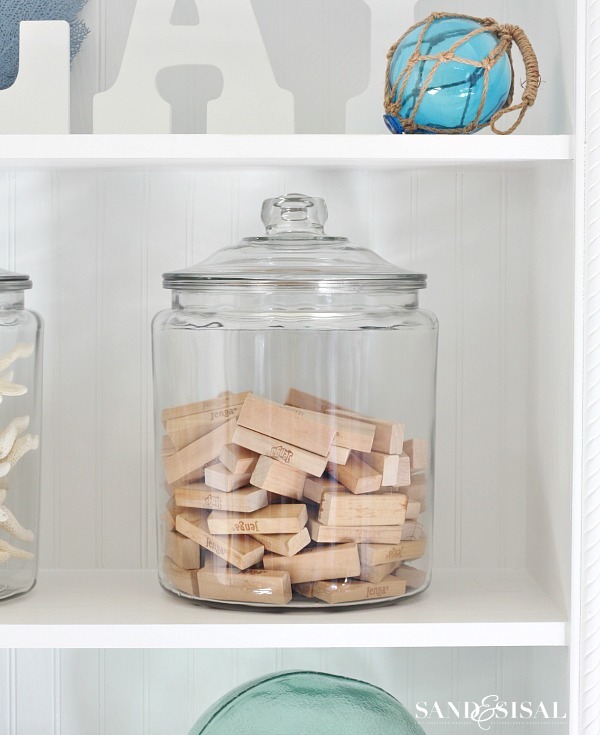 I love the glass jars and the baskets for all the toys. I am sure your kiddo’s love it too! THank you Jessica! I am seriously in love with the whole room now! Looks awesome, Kim–a great space for kids, but pretty and very much your style as well! You did a wonderful job in your FROG. As for my bonus room. . . well. . . I’ve given up. It’s pretty much overrun by LEGO now. Of course, our house is LEGOLand North Carolina. Mercy! We’ve turned the train table into a lego table and I’m often piercing my feet walking in the dark at night on those little sharp legos!!! It’s really lovely. I love how the light floods in, and despite it being a play room, it looks really relaxing and quite serene. Well done! Love this room, so bright! The build-ins are awesome and you decorated them beautifully, it all looks like straight out of a magazine! Thank you Christina! What a nice compliment! Thank you Bethy-babes! Marky loves the reading nook! I swear he hasn’t read so much as since he now has a fun and cozy place to read! And especially since I’ve reorganized the books into categories, he’s finding “new” books to discover (once again). HiHi Love the room what is the paint colour?? ?